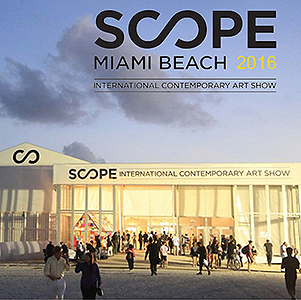 The 16th edition of SCOPE Miami Beach returns to the sands of Ocean Drive and 8th Street. Featuring 125 International Exhibitors from 22 countries and 57 cities, SCOPE Miami Beach will welcome over 50,000 visitors over the course of 6 days. Amidst an unprecedented outpouring of critical acclaim from press, curators and collectors, and a digital and social media outreach campaign garnering over 450 million impressions. Look for Thinkspace near the fair’s main entrance at booth F05, bringing the heat with mini solo shows from Cinta Vidal and David Cooley + new bodies of work from Alex Yanes / Alexis Diaz / Brian Mashburn / Brian M. Viveros / Glennray Tutor / Jean Labourdette / Josh Keyes & Sergio Garcia + our wall of sixty 12×12 inch works from our family of internationally renowned artists.